Dress codes are tough, especially for weddings. There are at least a few rules – you know, never wear white, no clubwear, etc. But, instead of thinking about what not to wear, let’s think about what to wear. 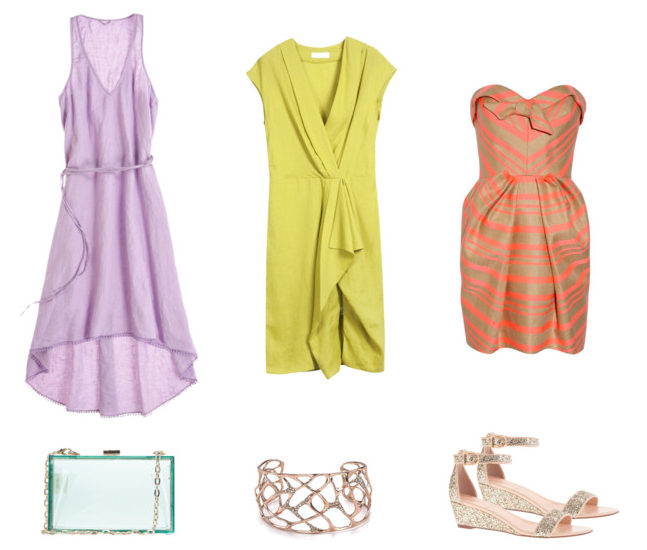 The trick for floating through a wedding that is beachy-keen is to think light: light colors, fabrics and accessories. You’re not wearing a beach cover-up, but rather a dress in linen, jersey or cotton blend. Choose colors, that are not white, but celebrate the season and make you look radiant with your own summery glow. Your accessories should be light, too. What do you need to carry after all? A phone, a lipgloss and a pair of keys? Keep it cool with lucite for an extra pop of fun, raffia and natural fabrics. For jewelry, one statement piece is all the statement you need to make. For footwear, a little sparkle is great, but skip the staggering heel which is never a friend to the sand. This entry was posted in Her Closet, Her Weddings + Events, Wedding Fashion and tagged beach wedding, what to wear, what to wear to summer weddings. Bookmark the permalink.